Create a joint venture between UK companies with this Joint Venture Agreement template for the United Kingdom. The Agreement does not set up a partnership between the parties. The profits and losses of the joint venturers will be allocated among the venturers in proportion to their respective capital contributions. One of the joint venturers will manage the business and will be paid a fee for his/her services, and be reimbursed for all reasonable expenses incurred. Each of the venturers will use all reasonable endeavours to promote the business of the joint venture. Each of the venturers is responsible for keeping confidential any information of a proprietary nature with respect to the joint venture or the other venturers. Intellectual property contributed for the benefit of the joint venture remains the property of the contributing party. 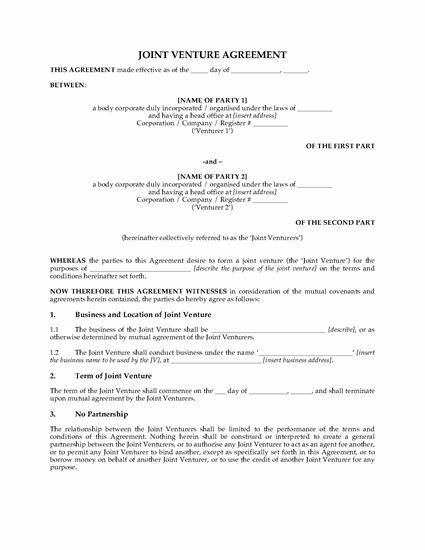 This UK Joint Venture Agreement is in MS Word format and is fully editable.